At a Sony press event in New York City last week, I was able to try out PlayStation Move for the first time. 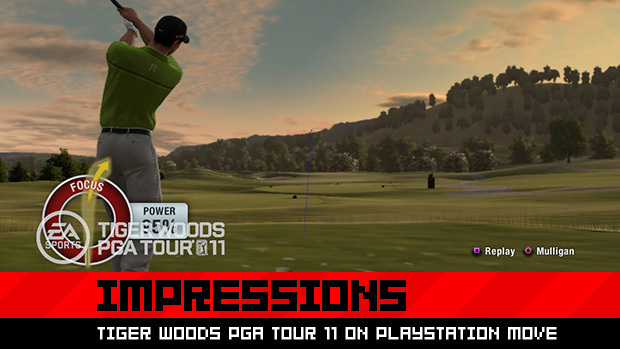 Tiger Woods PGA Tour 11 was among the games I played, and it was immediately impressive. Here's how it works. You grasp the Move wand like a golf club, and use the face buttons to select a club. The big button in the center of the wand, simply named the "Move button," serves the function of the O button in the regular game -- it zooms the camera to the landing area of your shot. When zoomed in, you hold the trigger and point the wand at the screen to move your shot target left or right. Once your target is set, you tap the Move button to go back to your behind-the-player camera angle for the shot. Then you aim the wand straight down toward the floor and hold the trigger to "lock in" your shot. After that, you're ready to swing away. I spent part of my 4th of July weekend in Myrtle Beach, SC, where I played some golf for the first time in my life. I hooked most of my drives -- they veered off way to the left -- and that stroke was now evinced in PGA Tour 11 as well, thanks to PlayStation Move. My first few shots went so far leftward that I had to compensate by twisting my wrists to the right as I swung (and of course, I then ended up overcompensating). The point here is that Move works, and it works well. During my demo, I asked the EA Tiburon developer on hand if he felt that there was any appreciable difference between the experiences that Move and Wii MotionPlus offer. He said that they're essentially identical, except that the ergonomically shaped Move wand feels better in his hand -- to be specific, it feels more like a golf club to him -- than the Wii Remote. And of course, there's no comparison between the beautifully rendered high-definition environments on the PlayStation 3 and the 480p output of the Wii. Look for Move support to come to Tiger Woods PGA Tour 11 via a launch-window patch.